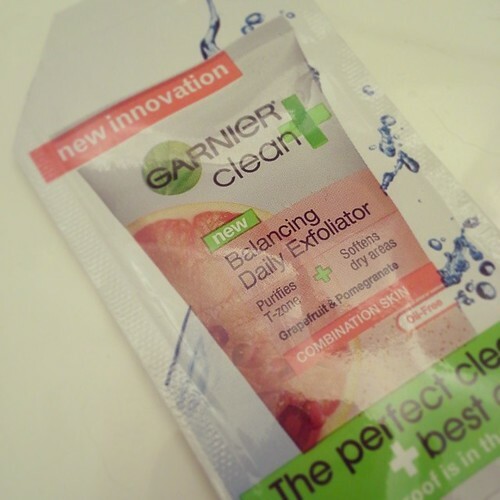 I received a sample packet of Garnier Clean+ Balancing Daily Exfoliator scrub in the mail from Garnier. This is perhaps more of a first impression than a real full review. I have tried it once now. “In 1 use: Excess oil is removed and skin is smoothed. It’s a mostly clear gel with bits of exfoliation material. They’re not very concentrated though so it’s not as scrubby as I expected it to be. It sudses (is that a word? it does not look right to me but in my head it sounds like it’s supposed to be a word) up a little and smells really nice. It immediately brought to mind a scented doll I had when I was little named Rose Petal. I detect a bit of grapefruit to it too but mostly Rose Petal. It’s kind of neat the way that scents can bring back memories like that. This one is a very positive association. So thanks for that, Garnier! My skin started to feel a little dry/tight very quickly after I toweled dry so I needed to moisturize right after. So far I like this one. I will try to remember to update after I have the chance to use it more. The sample has plenty in it so I should be able to squeeze quite a few days out of it. This entry was posted in facial care and tagged face scrub, facial care, first impression, garnier, garnier clean+ Balancing Daily Exfoliator, review.